Ever notice how when your skin is freaking out, you pare back your routine to the bare minimum? Like me, you probably cut out strong actives such as acids and retinol, up the hydration and stick to only three-five products (or less) in a routine. Sound familiar? It is something I think almost everyone does instinctively and there’s a good reason for it – this just might be what our skin really wants from us. While it has become increasingly popular to acquire lots of products and perform up to ten steps per routine, most of us could very easily use way less and have better skin for it. Boring, I know, but it’s a truth I have finally accepted about my skin and it has made such a big difference. My skincare journey has not been straightforward by any means and my product stash has drastically fluctuated over the years. I started off with relatively “normal” skin during my teens (a few spots, but nothing serious) and maybe a total of five products. Then there was the period of time in my twenties when all I used was baby wipes and a moisturizer day and night because my skin was pretty much “perfect”. Next, when I got sick in my late-twenties and my skin went crazy I bought every single thing that was recommended to me and it would not be an exaggeration to say that at that time I probably had 100+ products in my arsenal (all paid for myself). Back then that was extremely excessive, but now it’s a pretty standard amount for a lot of skincare lovers (blogger or not) and I don’t think it’s realistic or sensible. Since I started my blog almost three years go I have tried, tested and yes accumulated a lot, but I have also found a happy medium between having too much and enjoying a good mix of products. I definitely have much more than I “need” because I still write about new launches, but now I don’t feel like I have to hoard it all because I understand the difference between a great product and a great product for my skin. 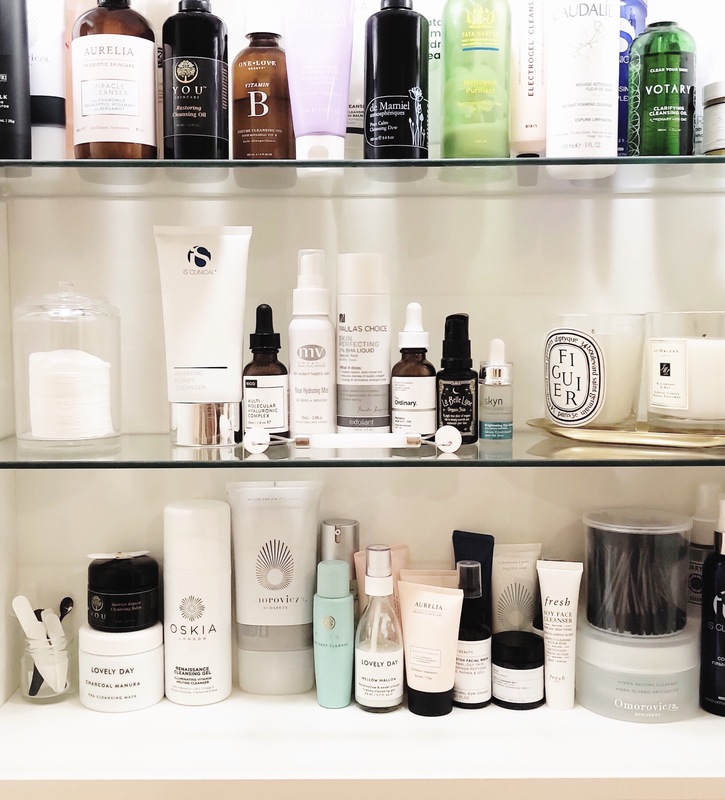 Unfortunately, excess seems to be “in” when it comes to skincare at the moment and despite how aspirational it might look to have and post about hundreds of products, actually using that many won’t do your skin any favours. I know this from experience and even though in the beginning it was fun and exciting to use a different cleanser every night or mix my serums, it eventually became overwhelming and I found I was doing more damage than good. Thankfully, I re-learned an important lesson about simplicity and consistency in skincare during autumn and winter, that while being very boring, has given me some much needed control over my skin and stash. Now, of course everyone’s skin is different and personal taste will have one person loving a product another hates, I think there are some basic universal guidelines that can be applied to all skin types. These helped me achieve the best from my skin without feeling like I needed to use every single product ever made and maybe they could help you, too. This means finding the right cleanser for your skin type with a texture you enjoy using and then deciding on a cleansing routine that works for your skin. For some that will be the “standard” but not set in stone twice at night and once in the morning. For others, it will mean once at night with a wash cloth and then just a rinse with water in the morning, it’s entirely up to you. The most important thing to remember is to use something that will not dehydrate your skin and lead to “rebound oiliness”, no matter what skin type you have. It is also fine to have more than one cleanser and I personally like having options in texture and performance as my skin is combination. This typically refer to serums, but could also extend to toners, mists and essences. It’s basically any product that forms the core of your routine in terms of “active” ingredients which can deliver the best results. I have found that it is better for my skin if I don’t overload it and keep the actives to no more than 1-3 max per routine. I alternate acids and retinol at night and during the day I use antioxidants and sun protection. I like to use what I think my skin could benefit from the most and focus on my main concerns instead of trying to use every seemingly life changing ingredient out there. I feel like I have seen the best results by doing this and I think it’s because my skin isn’t trying to respond to multiple actives all at once. Probably the most boring advice of all, but definitely one of the most important. It might seem obvious, but I know so many people who have given up on products before they have even had a chance to see any results. With a lot of ingredients the effects are cumulative, meaning the more you use them the better they perform. I have found that rotating the same set of actives has worked very well for me and that’s because I am giving the ingredients the time they need to fully get to work. No matter what your skin type is, consistency is so important and could make all the difference between you constantly fighting your skin and finally being in harmony with it. It is so important to pay attention to your skin. While I wholly advocate being consistent, if something clearly isn’t working for you then please stop using it. Not only that, just because something sounds good on paper and has worked wonders for someone else, doesn’t mean it will be right for you. Regardless of how much you love a brand or how beautiful the packaging is, make sure the product is actually giving you results, or you’re just wasting money on something that looks good but doesn’t perform. Hydration, hydration, hydration! This is hands down the number one tip I recommend to every single person that messages me for advice, no matter if they are dealing with acne, hyper-pigmentation, wrinkles or flaky skin. Hydration is the key to skin that is balanced, healthy and able to defend and repair itself. For example, with my hyper-pigmentation I see a big difference in how it appears when my skin is dry vs when it is hydrated. When my skin is dry the marks seem even darker, but when my skin is properly hydrated my skin glows and the pigmentation looks less noticeable as a result. While it’s a given that dry/dehydrated skin probably needs more hydration, the same is likely true for those who are very oily and suffering from breakouts. Underlying dryness for some people will manifest itself in excess oil production and then pores that become clogged. Keeping oily and acne prone skin hydrated will encourage balanced oil production and help any blemishes heal better/faster. Exfoliation should be an integral part of almost everyone’s routine, but it is all too easy to over do it. Be mindful of the ingredients in the products you are using and make sure you’re not exfoliating in too many steps. If you’re using a washcloth (manual exfoliation) to cleanse, then an exfoliating toner and a serum with acids or retinol, that is probably too much for one routine. I used to exfoliate twice a day, every day and now I stick to just once a day in one step and my skin is much more balanced and resilient now. Obviously this will not give you the same thrill as splurging on full size products, but it will help you test multiple products without spending more money than necessary. I have tried samples of products that sounded perfect for me, but once on my skin, I found I didn’t like the texture, scent or results. By getting samples you have the chance to see how much you really like something, if it will work well for your skin and if it’s actually worth the price/hype. Doing this will also help keep your stash manageable and give you a better idea of the textures and ingredients that suit your skin type best, all without amassing more products than you could use in a lifetime. Yep, all those very boring recommendations about healthy eating, a good night’s sleep, exercise, supplements and plenty of water extend to your skin too. Happy skin is healthy skin and achieving that goes beyond just what we put on our faces. It’s a self-care lifestyle that involves lowering your stress levels, feeding your skin from the inside out, supporting your digestive and detoxifying organs, boosting circulation and ultimately looking as good as you feel. When I don’t eat well or sleep enough it will show on my skin soon enough, so a 360 approach to health and wellness is just as important to me as a solid routine. I have always believed that skincare should be enjoyable. There was definitely a time when buying lots of stuff and using it all at once was “fun”, but in the end I found I wasn’t really connecting with the products or the process and my skin wasn’t even at its best. Now I feel like I have balance between indulging in skincare as a hobby, but still focusing on achieving great results, which is essentially the point of it all. I also think that skincare is very personal and whatever your philosophy is it should make you happy. 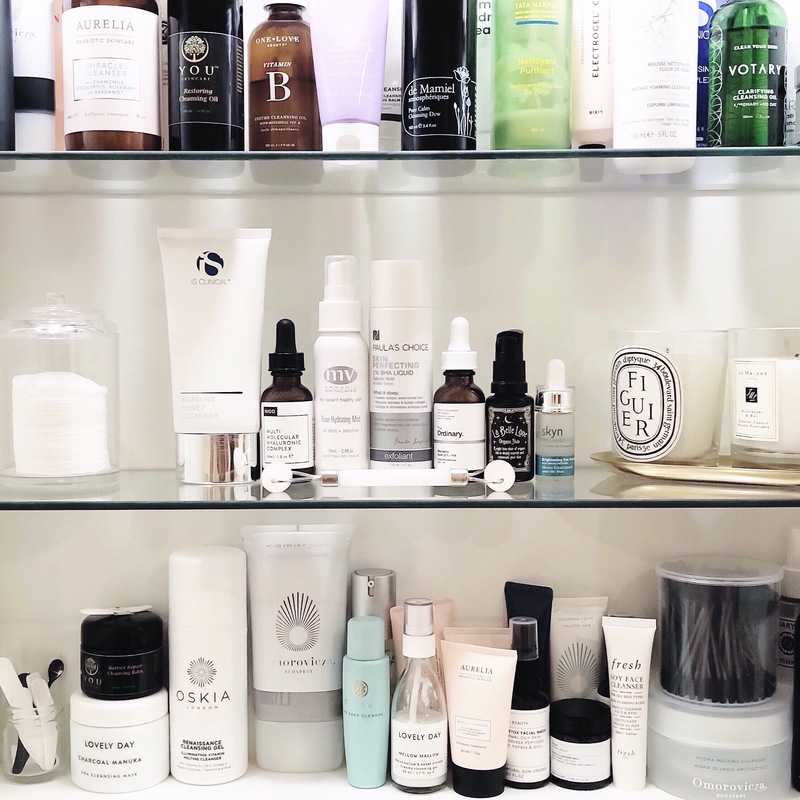 If being a minimalist works well for you then great, but if rotating lots of products is what you like and you’re seeing results then go for it. Just don’t get too caught up in the marketing hype and feel like you’re missing out if you don’t buy every new launch because there’s nothing wrong with being loyal to what has always worked well for your skin. In the end, it is completely up to you what you choose to put on your skin, but bear in mind that sometimes when it comes to skin, less isn’t just more, it could be everything. One of the BEST reads I have seen in my skincare journey. I am new to all of this and it can be so overwhelming. I appreciate your thoughts and definitely agree with you. This post is going to save you so much money and frustration (I speak from experience). Great read, and makes me feel better about my own skincare regime! Over the last couple of years I’ve found myself thinking “everyone seems to use so many products, maybe I should too!” But really my skin is in good nick given that I only ever use 1-3 products (and always have done…I’m 36). Im definitely a believer in less is more for my facial skincare! Oh so sensible. I broke my right wrist a couple of weeks ago, being a right-handed person of course. Am ham-fisted with the left hand, can’t unscrew lids, use droppers or even clean my face properly. Got MOH to open one serum, one moisturiser, one oil and a toner and leave the lids loose. Cleansing has become rather skimpy and using products a bit swipe-y! However, my skin remains smooth, i.e., the same as before. Hi Toria! So happy to hear you liked the post! 🙂 Like you, my skin loves a simple routine, but honestly I am weak willed too! Arly, thank you for this refreshing and honest post. I posted a YouTube video about two months ago where I talked about social media and how easy it is to get caught up in wanting the newest product (whether it’s a skin or makeup) and it’s easy to one day realize you have way too many products. I’m an esthetician who loves to try new products. Now I have way too many products that will expire before I can use them. Now I try to get a sample of something before I make a purchase, whether it’s a cleanser, moisturizer or Foundation. Not sure what happened but I just received a notification about your response. Thanks for watching my video. I agree samples are best and often tell people if the product can be purchased at a store that gives samples (such as Sephora or Nordstrom’s) then pick up a sample when possible. And, yes, it’s very difficult having that desire to try everything. So many brands and products, too little time. Best skincare post I have read in a long time! I am just about learning this principle too that less is absolutely best. When I started beauty blogging as a hobby (and it still is a hobby), it was quite easy to accumulate lots of products. By all means, my collection is “small” compared to many beauty enthusiasts but for me it was still too much so I learnt to have self-control over that and over my routines as a whole. What am I using everyday and are giving me results? What do I keep buying and why? Do I need this product in my collection or can I happily live without it? I think about these questions when I’m beauty shopping. Hi! I’m a new reader to your blog and it is very informative. I just started my skincare journey and I’m curious your thoughts on microdermabrasion. Is this part of your routine on occasion?